Hello dear readers! Today's post is a doozy. VERY pic heavy! So I'm gonna be a party pooper and put this post under a jump. SO SORRY! Get prepared and start heatin' up your high speed internet! Have you ever frankened before? It's the process of combining polishes or polishes and pigments to make "frankenpolishes." When Butter London's "The Black Knight" came out, a few of my Facebook polish friends decided they would try to dupe it -- on the cheap! I have followed both of their recipes to the best of my ability and thought I'd share the processes and outcomes for both. The geniuses behind these two polishes? 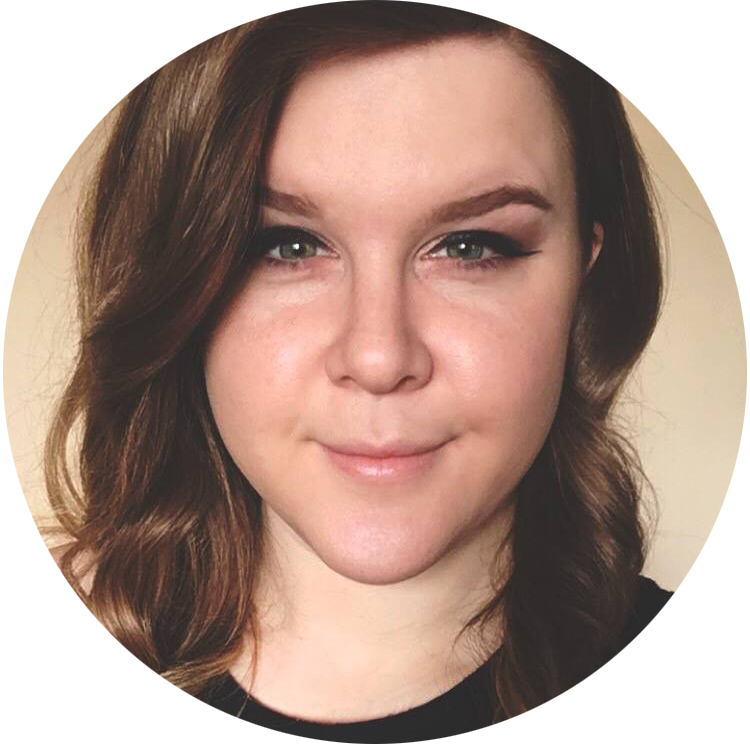 Jessica from Hello, Polish! and Laurie N. (no blog)! 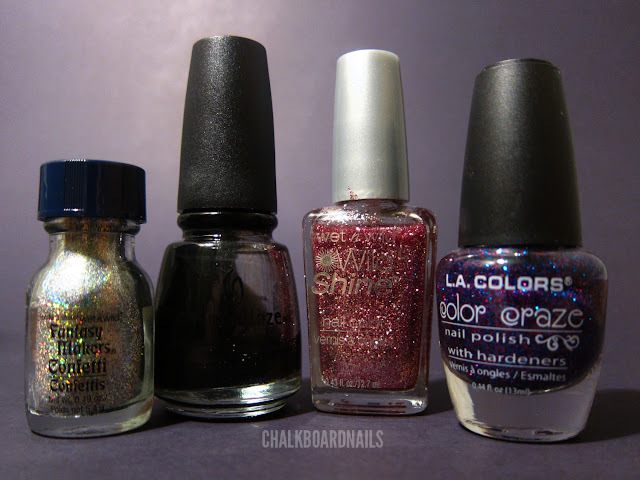 Hit the jump to discover the recipes for each, and see how these polishes look on my nails! 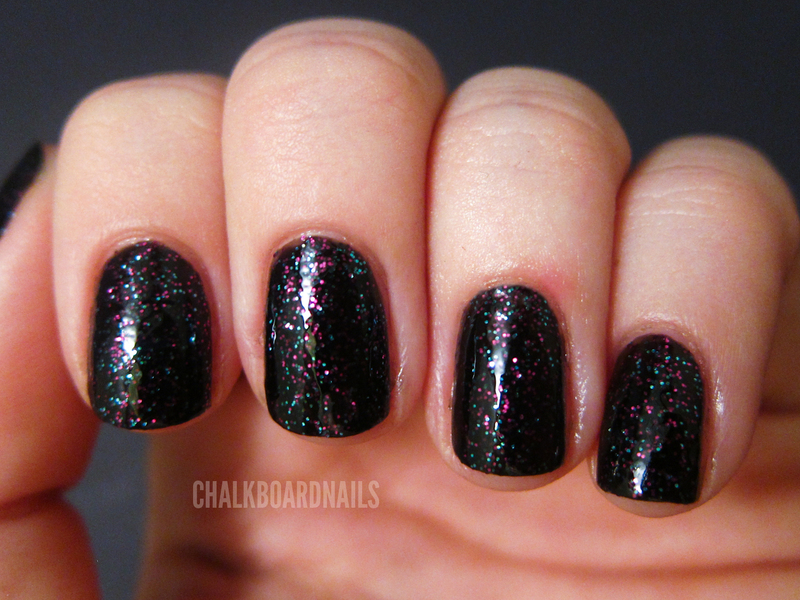 Franken A: By Jessica of Hello, Polish! This franken starts out with only two ingredients! Sinful Colors Frenzy and China Glaze Liquid Leather. Pour out a little less than a fourth of the Sinful Colors Frenzy. If you have an empty polish bottle lying around, pour it into that, and save the rest to franken with later! Fill the empty space that you created in the Sinful Colors bottle with some Liquid Leather. Shake it up like CRAZY! Shake it till your arms fall off! Here's Jessica's recipe on my nails. And here are some photos from Jessica herself from her bottle! Franken B: By Laurie N.
Laurie's franken has a few more ingredients, but nothing too complicated! I'm sure you guys can handle it. You'll need a black (China Glaze Liquid Leather), Wet N Wild Wild Shine in Sparked, LA Colors Jewel Tone, and a loose scattered holo glitter (I'm using the Fantasy Makers Confetti glitter by Wet N Wild that was part of their Halloween line -- if you can't find that, Laurie used a loose holo glitter by Coastal Scents). For this one, I frankened into the China Glaze bottle because it was almost empty. Basically though, if you are frankening into the LA Colors bottle, you should empty out about a third of it. Add in a touch of the Wet N Wild Sparked. You don't need much of this! A little bit goes a long way. 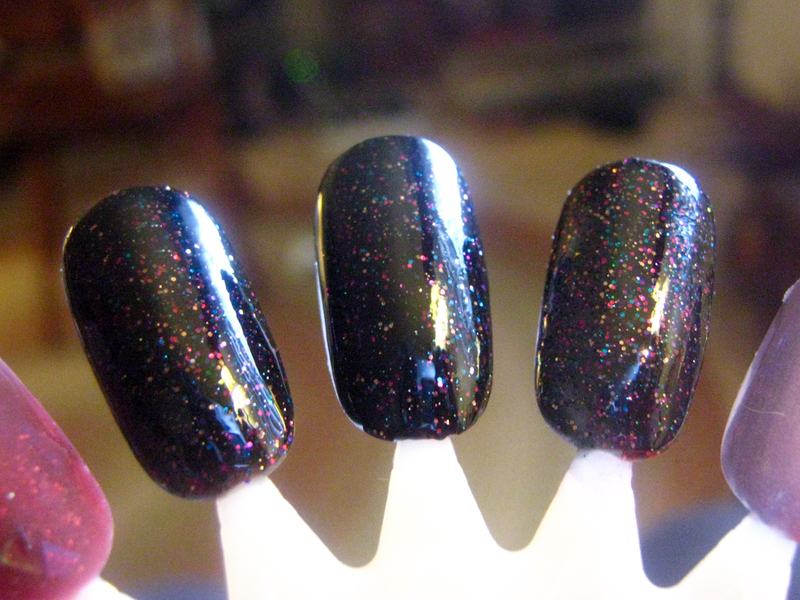 Then, add in some of the loose holo glitter. You can use a drinking straw cut into a shovel to scoop it in to your franken. I used two little straw scoops worth of the holo glitter for mine, but I think I went a little overboard! 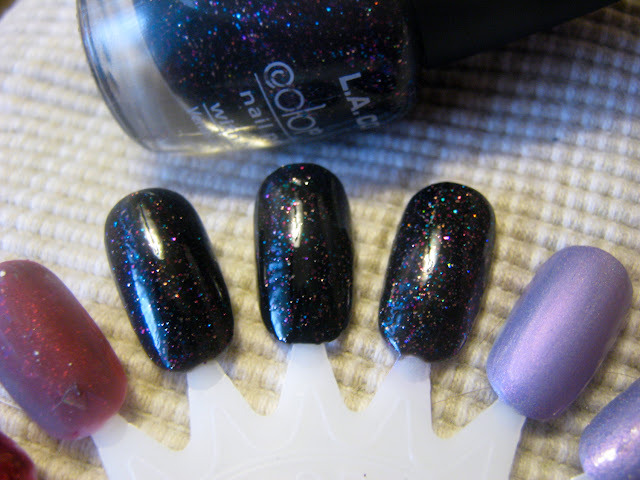 Laurie was much more conservative with her holo glitter. It's just a different effect -- up to you! Then, fill up the rest of the bottle with your black. This one will need a lot of shaking because of all of the loose dry glitter. So shake shake shake shake shake shake. And then shake some more. Think you're done? Nope. Keep shaking. 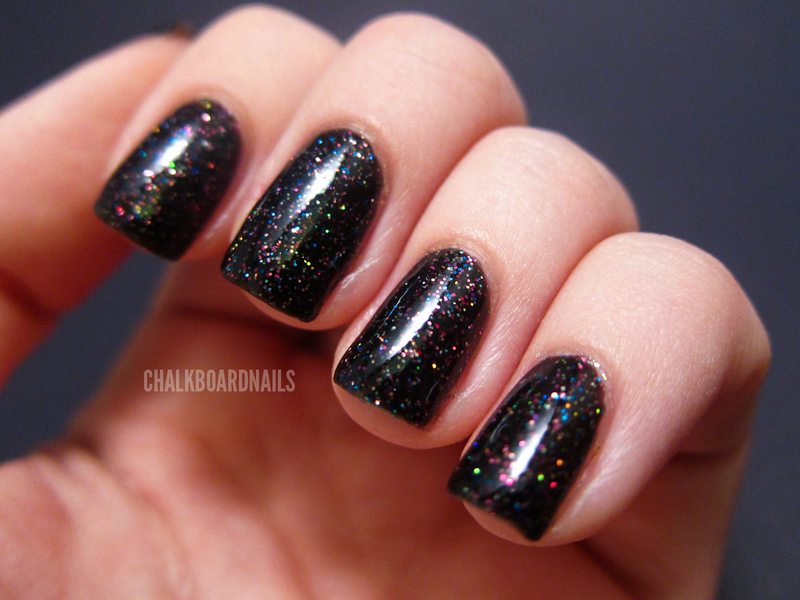 And here are Laurie's photos of her version, with the more sparse holo glitter - I think that her version looks closer to the actual Black Knight than mine does! I'm very much in love with both of these polishes! They each bring something different but uniquely beautiful. I hope you enjoyed these recipes from these two lovely ladies, and give them a shout if you try either of their formulas! I like the second one, by Laurie, a lot!!! Like would buy it!!! I think someone needs to get into Franken-makin(Ha! Say that out loud!). Nice post. I actually had to ask someone a few weeks ago what Franken's were. Do they always have to be mixed polishes? Or can you just throw random craft items into a clear coat? @Patricia - There are no rules in frankening! Sometimes when you mix in loose glitter or other craft items, it can react with the polish and the color can melt off of it. It's hard to tell what will work though and what won't, so usually people just try stuff and hope it works! That's part of the fun! Cool post, and thanks so much for the clear directions on how the process works for both polish frankens. Now that my challenge is over I may give this a whirl. I am going to try these out! You did great job! The second franken is especially beautiful! Everything about this post is LOVE! Wow, those are both beautiful. Thank you so much for the recipes! I am definitely try this. Thank you very much. I really didn't want to pay $14 for it. Thanks so much for this post! I wanted to get Black Knight but couldn't bring myself to pay that price...This is an easy (and cheap!)fix! !